Fluid-cell specimen with heater element near the bottom and a needle probe thermocouple for boundary condition temperature measurement along the walls and internal temperature measurement for validation of the CSLH microscope proof-of-concept design. The fluid specimen is placed in the object beam path and a constant temperature phantom object with constant refractive index and similar focal length properties is placed in the reference beam path within the telecentric lens. 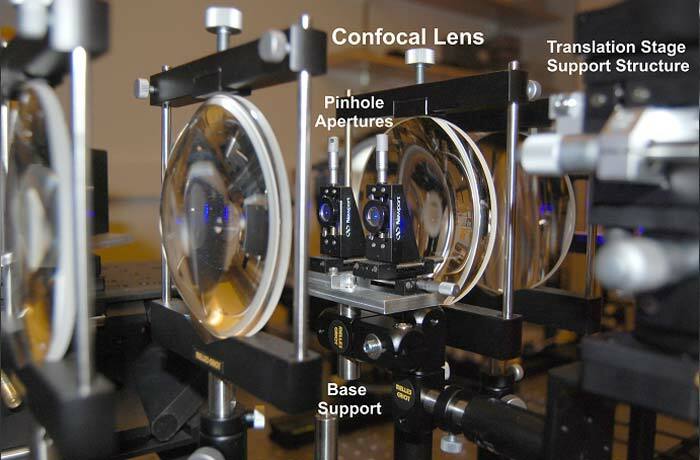 The telecentric lens with phantom object provides equivalent focusing and re-collimation for the two side-by-side wavefront split beams. The telecentric lens is also used for the confocal apertures which conjugates the rays that pass through the pinhole apertures to the focal point within the specimen. The focal point of the object beam is translation scanned through the fluid-cell as the focal points remain stationary on the pinhole apertures due to reverse or back beam propagation through the scan mirror section. Minor positional adjustments to the pinhole apertures are required due to the off-axis scanning aberrations and coma. The telecentric lens with fluid-cell cuvettes is mounted to a translation stage so that the fluid-cells remain stationary during scanning. 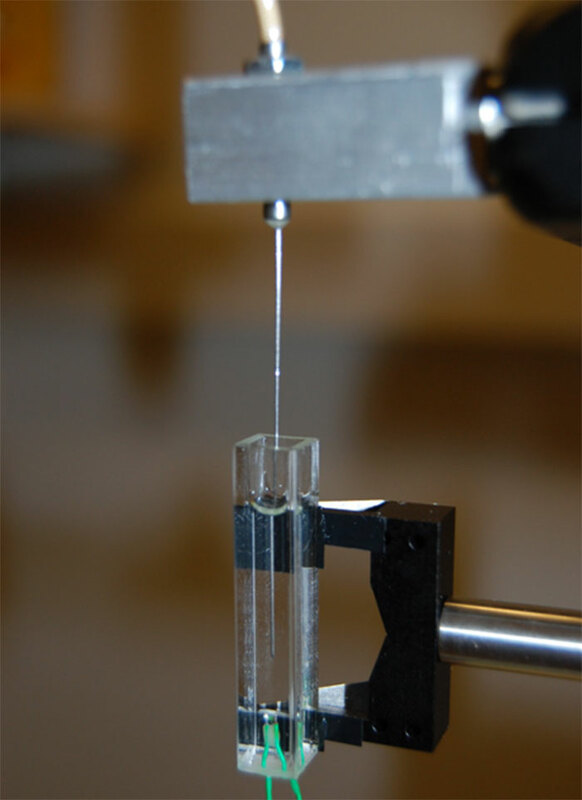 The stationary fluid-cell(s) provides capability to perform scientific fluid motion and heat transfer studies in microgravity where disturbance vibrations to the specimen are held to an absolute minimum. A uniquely derived tomographic reconstruction algorithm that uses only the numerical aperture of the beam for angular scanning provides the three-dimensional temperature distribution from the measured hologram data. The numerical aperture or cone angle of the beam is 28� which is significantly smaller than the scanning angles currently used in tomography. In this application the "wily" path length matrix method is used for reconstruction since traditional filtered back projection method does not work for phase imaged holograms. 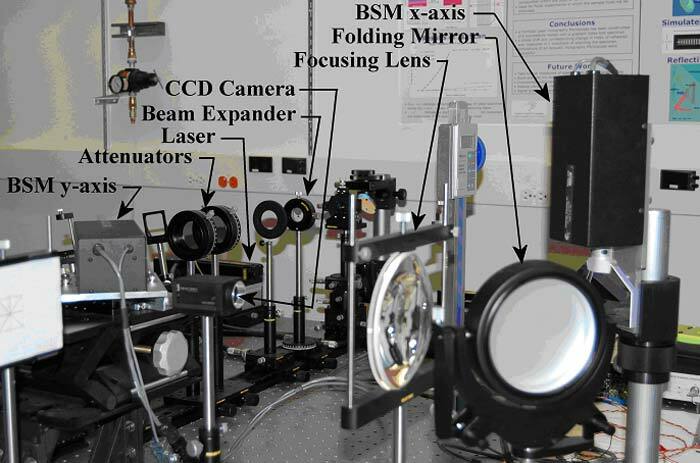 A high-resolution CCD camera and 457nm blue light laser was used to calibrate the galvanometer x-axis and y-axis BSMs (Beam Steering Mirrors). The analog voltage outputs from the National Instruments (LabVIEW) data acquisition board provided the positional commands to the mirrors. Periscope pupil plane relay lenses were placed between the two mirrors and at the output of the horizontal axis scanning mirror. The cables run to custom PID (Proportional-Integral-Derivative) amplifier boards placed on the optics table and power suuplies beneath the table. 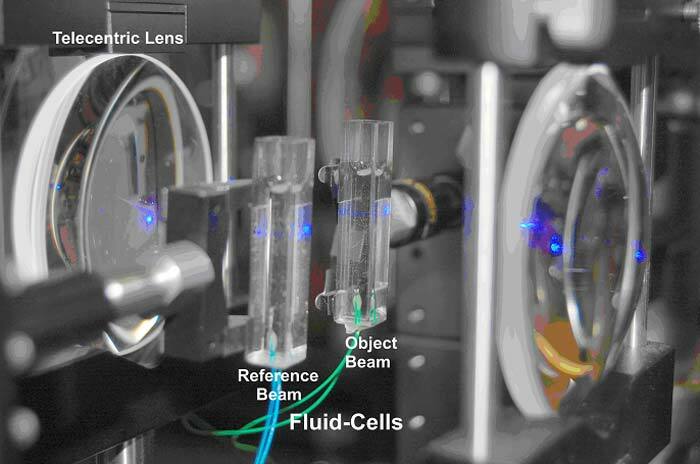 Calibration of the BSMs provided accurate focal point translation scanning within the fluid-cell for the experiments. 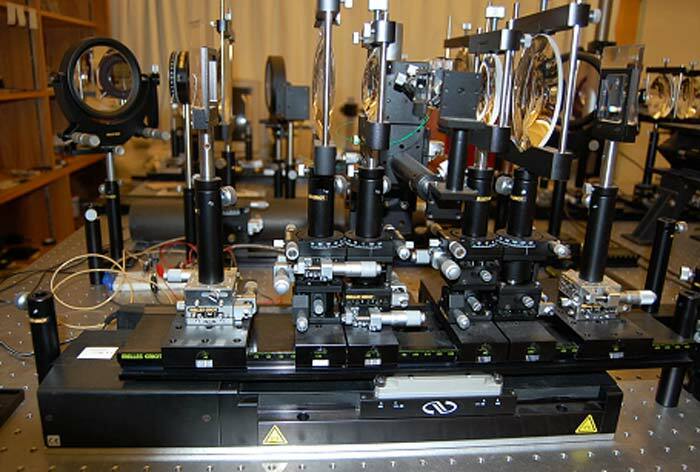 Some experts have claimed this to be one of the most complex optical microscopes ever built. The optical layout of the CSLH microscope showing the wavefront split laser source entering the scan mirror section. Not shown are two periscope lenses within the scan mirror section to reduce beam walk and to establish stationary pupil planes during scanning. The beams enter and exit the optical loop where the stationary specimen is scanned by the xy-axis scan mirrors and the z-axis translation of the telecentric optics around the specimen. The reference and object beams exit the optical loop and back propagate through the beam steering mirror section to be split off to the projector lens section. The projector lens contains the confocal optics where the focal points on the pinholes remain stationary during scanning and the beams are then converged with optical wedges or a Fresnel biprism to form a hologram on the camera where they completely overlap one another. 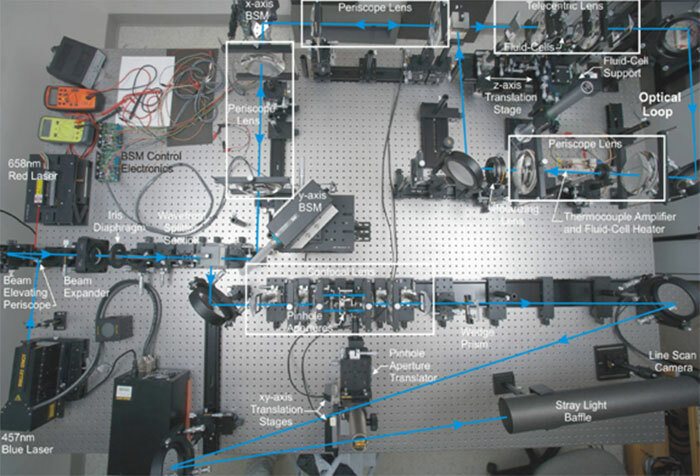 The optical layout on the optics table shows the sections and components of the CSLH microscope which demonstrated the ability to non-intrusively measure the three-dimensional temperature using a laser and no rotational scanning as found in medical CAT scanners. A unique "wily" matrix reconstruction algorithm was derived for the CSLH microscope to reconstruct the 3D temperature from the scanned holograms given a limited viewing angle of 28� which is significantly less than 160� (minimum) as typically used in tomographic applications.